Need an excuse to eat chocolate for breakfast? I usually don’t. But if you have judgey roommates, spouses, coworkers, pets or parents… here’s a DELICIOUS, healthy, more sensible (and socially acceptable) way to enjoy chocolate for breakfast. 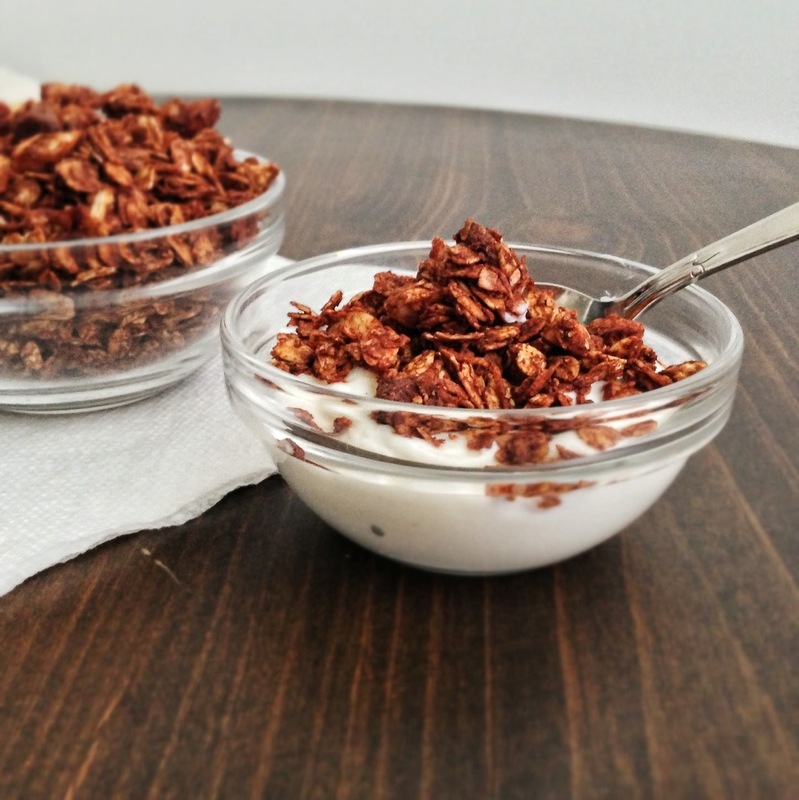 CHOCOLATE COCONUT GRANOLA! Crunchy, nutty, rich and chocolatey. Easy to prep and only 25 minutes to bake. 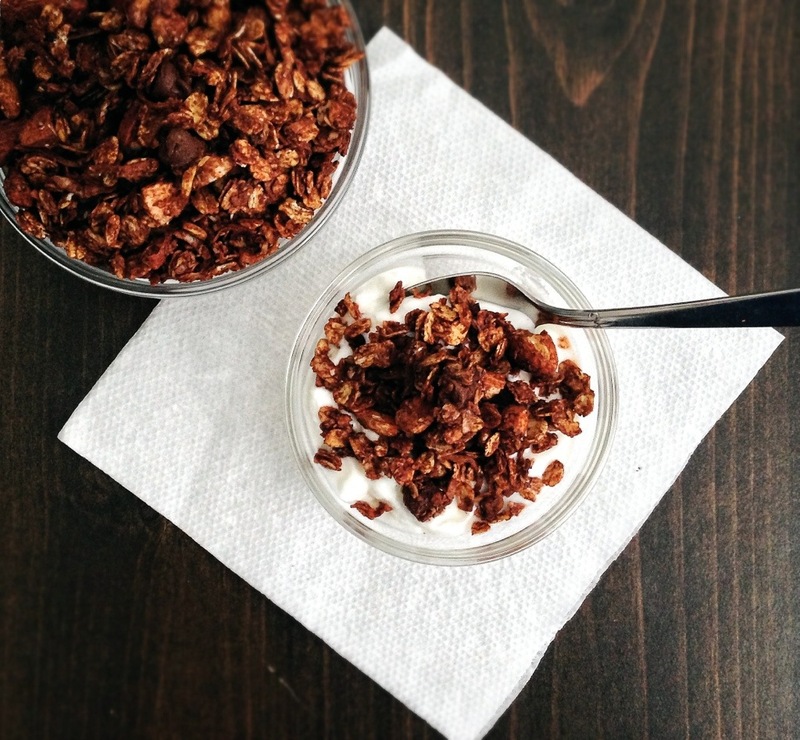 Get ready for your new favorite granola. As I have mentioned before, I LOVE eating sweet stuff for breakfast. I also really like granola. Really. What better way to cure those midweek “I don’t want to get out of bed” blues than by starting your day off with some morning chocolate! Chocolate is a great motivator. 🙂 Also, your kitchen will smell like chocolate cake while baking this. I’m getting hungry just thinking about that smell. 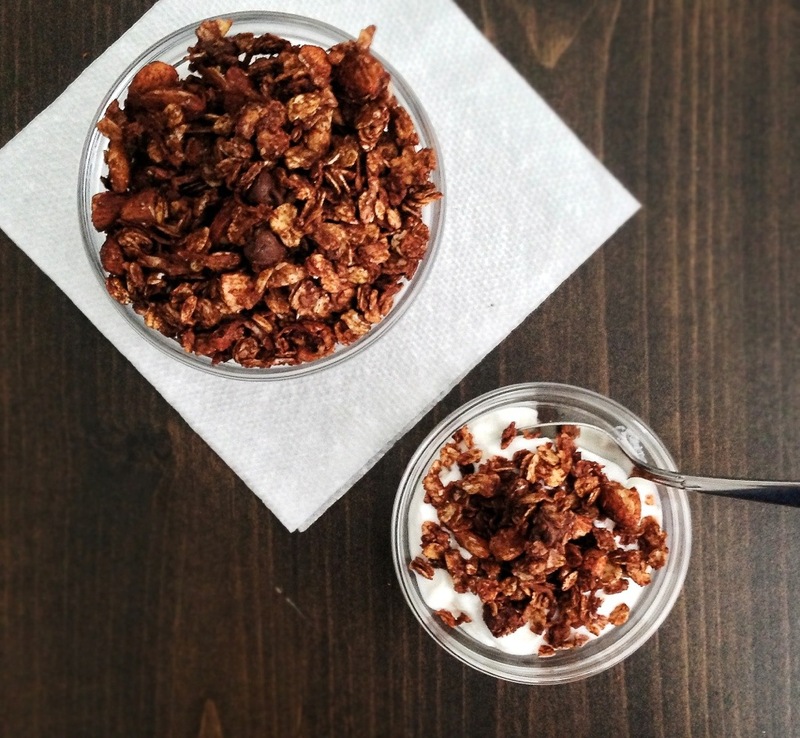 Of course, granola is not just for breakfast. 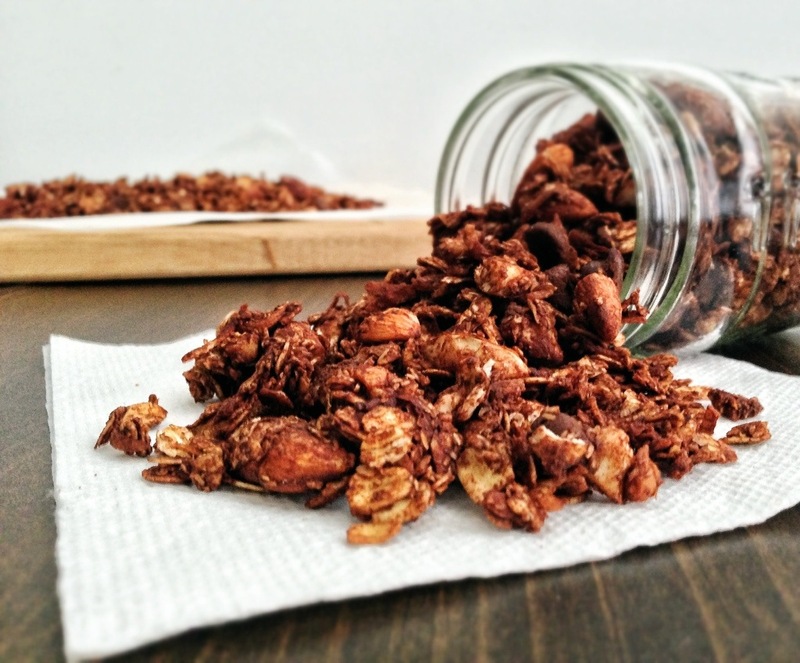 This crunchy, chocolatey treat makes a great topping for yogurt, ice cream or just by itself. While photographing this, I ate HANDFULS. That tends to get problematic when your subject amount keeps disappearing. Whoops. You might be saying: “How the heck is this stuff healthy? 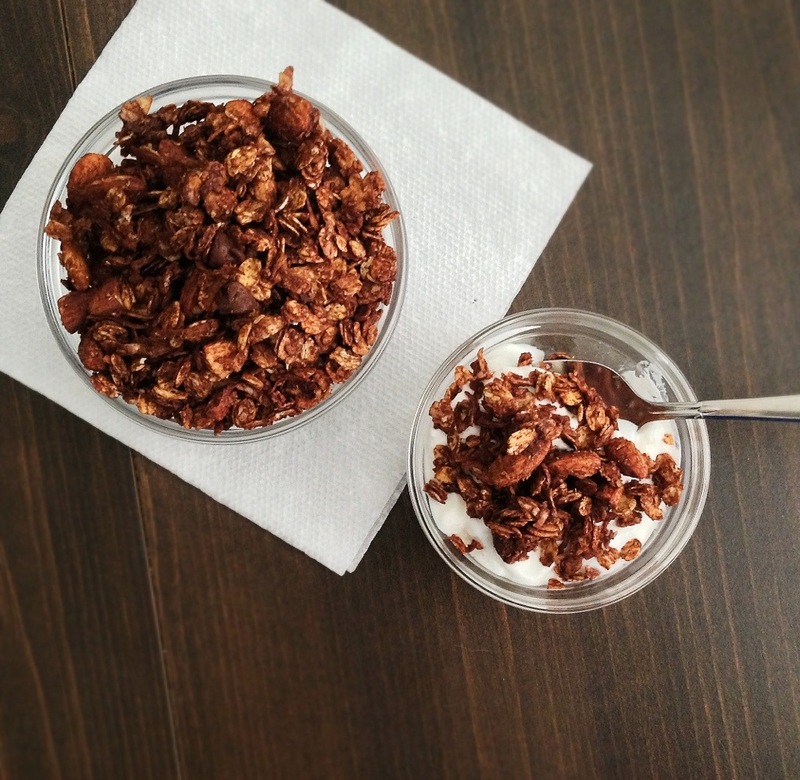 ?” To make this granola, I used my maple almond cinnamon granola recipe as a base. 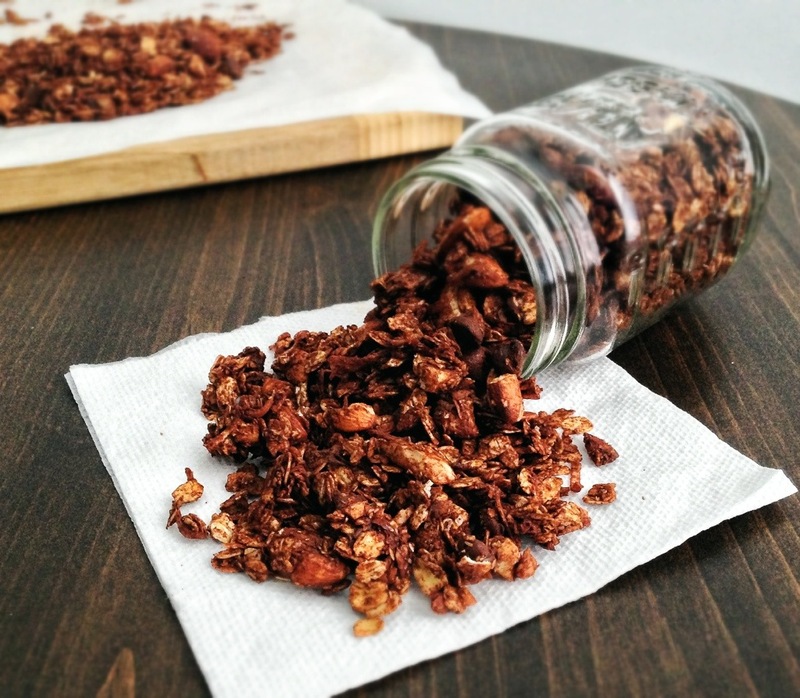 This Chocolate Coconut Granola has a very similar sugar and fat content as the base recipe. How? I removed a little bit of the butter/oil fat and sugar to make up for the addition of some chocolate chips that really bring home the chocolate taste. I also added some flaxseed meal which adds some extra fiber and some healthy Omega-3s. You can totally omit this ingredient if you don’t have it. It won’t change the flavor with or without it. You’ll just be missing an extra “healthy” boost! So, go ahead. Have it for breakfast. You know you want to. 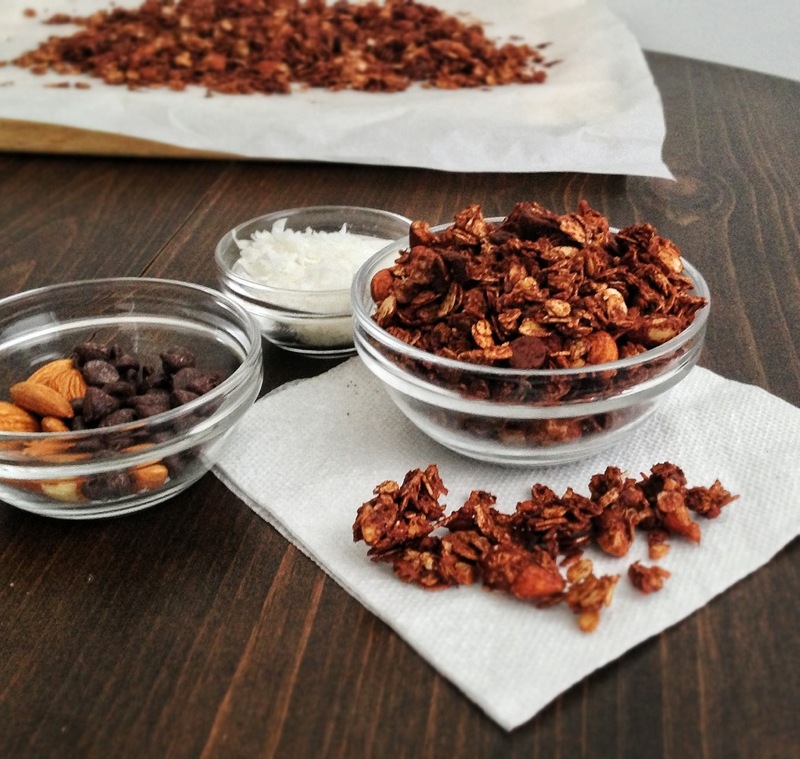 Another great thing about this granola: It’s adaptable. All you need are old fashioned oats and unsweetened cocoa powder. Other than that – you can do equal substitution of many ingredients. Don’t have almonds? That’s ok, substitute another type of raw nut. Don’t have nuts? Allergic to nuts? Sub in more oats. Allergic to coconut? (sorry Alana!) No worries, sub in more nuts or oats. Want to use coconut oil? Sure. Or flaxseed, double paleo, super slick, vegan, dairy-free, nut-free, caveman oil? No problem. Want to use butter? YES – go right ahead. Want to add dried fruit instead of chocolate chips? Wait, WHAT? Sure, you can. But you’re missing the point. Want to stick to the recipe? That’s cool too. Since I’ve posted variations of this recipe two other times, I’m not going to bore you with the details. I’ll save you the reading time. 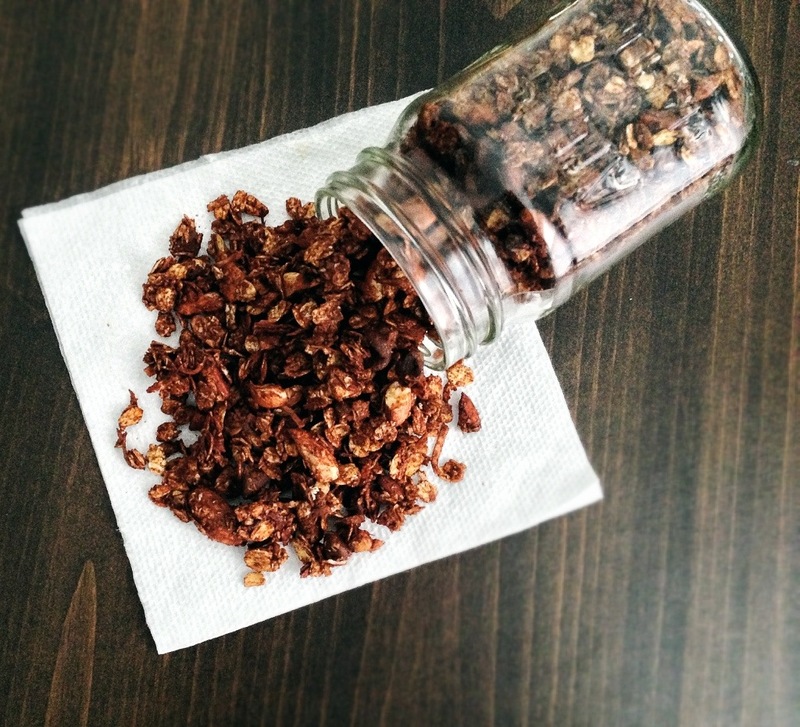 If you need more photo explanation – head on over to my first or second granola posts for more detailed process/prep pictures. I will stress, you want to mix in the cocoa powder with all your wet ingredients until smooth. It will look like a thin, chocolate ganache – and it will taste so rich and chocolatey. Mmmm – go ahead and give it a taste. Go. Make some. Make your house smell like chocolate cake that you can eat for breakfast! Preheat oven to 320 degrees F. Place oven rack on top 1/3 in the oven. Prepare a large baking sheet with parchment paper or nonstick aluminum foil and set aside. In a large bowl, combine the first set of ingredients (oats through the salt) and stir. In a small saucepan, add the oil, honey,*** water, brown sugar and cocoa powder. Whisk while gently heating on very low heat for about 1 minute. Then turn off heat and continue to mix until everything is smooth and well combined. Do not overheat – this mixture will burn easily. You can also mix this without heat, but I find warming the mixture makes it easier to get everything well combined and smooth. Pour liquid over oat mixture and stir until the oat mixture is well coated. Stir in chocolate chips and spread into a single layer on prepared baking sheet. Bake at 320 for 25 minutes – stirring once half way. Allow to cool to room temperature and store in a airtight container for up to 2 weeks. **Chocolate Chips are heat resistant and don’t melt, but they do get soft. 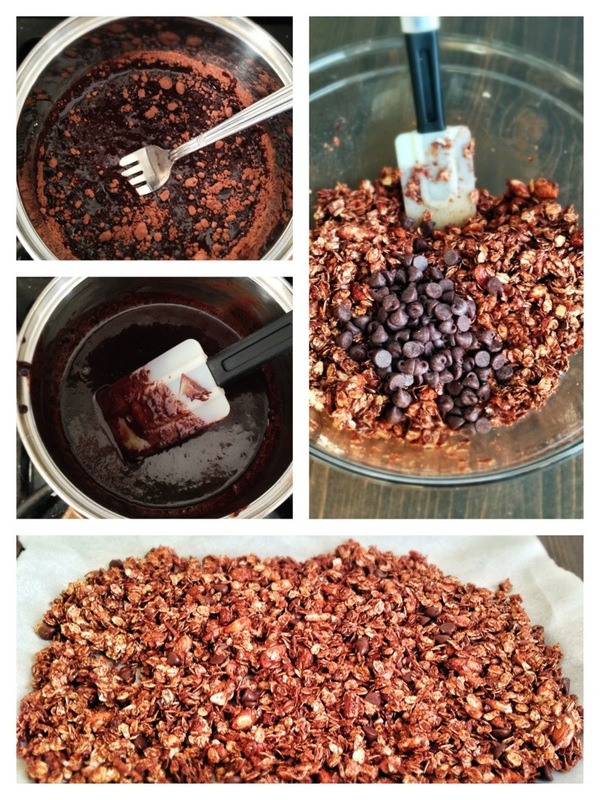 If you don’t want soft chips or are using baking chocolate, be sure to add this AFTER baking the granola. *** Be sure to add the oil first, then use the same tablespoon to measure honey, the honey will slide right out because the oil created a nonstick surface! Oops. I spilled again. I guess I’m just going to have to eat to clean up this mess. 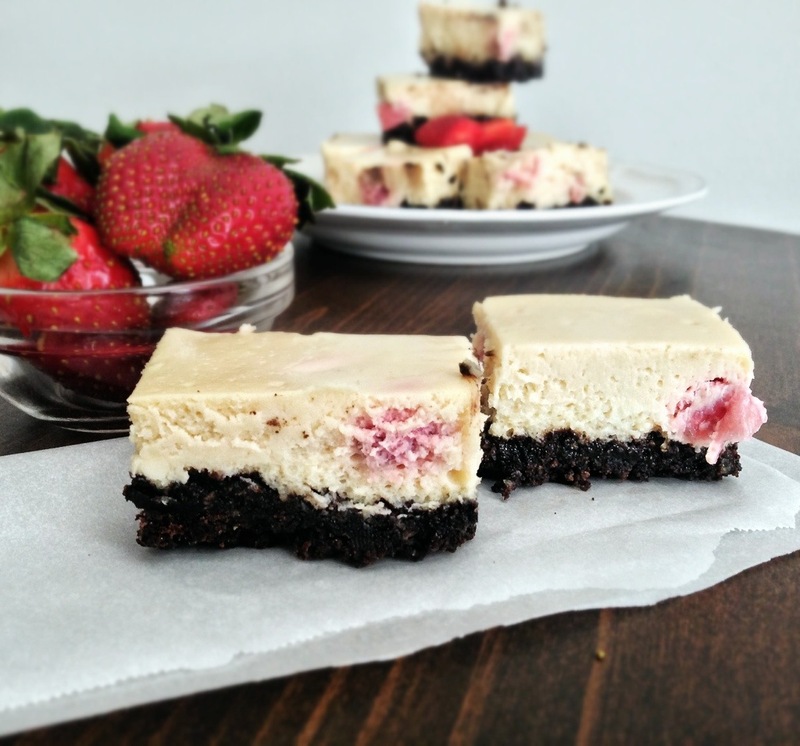 Pomegranate Strawberry Cheesecake bars made with Greek yogurt that will satisfy your craving for fruity Spring treats and won’t bust your waistline. 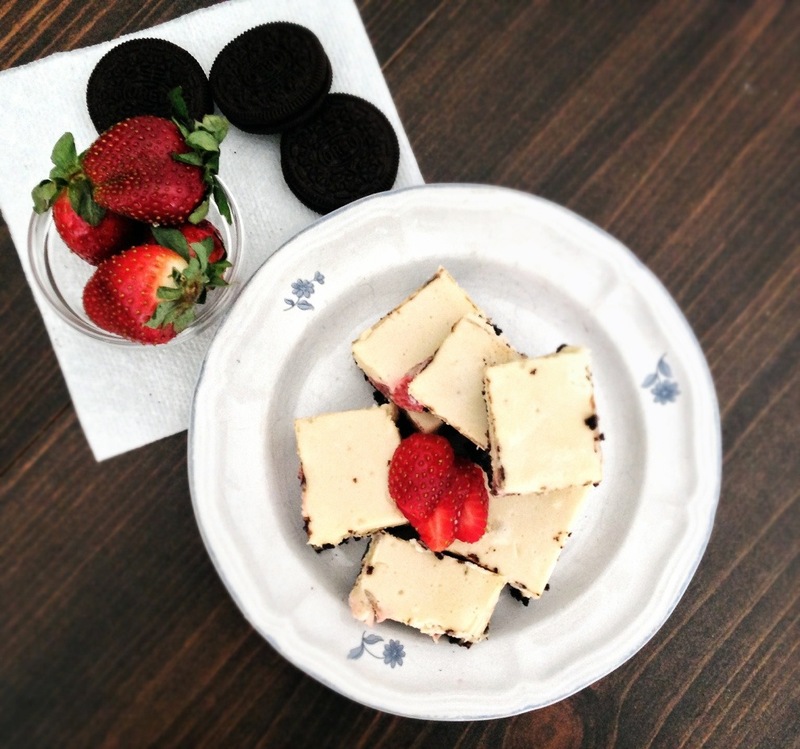 Fruit, Oreos and cheesecake!?! YES. This is what we’re making today. 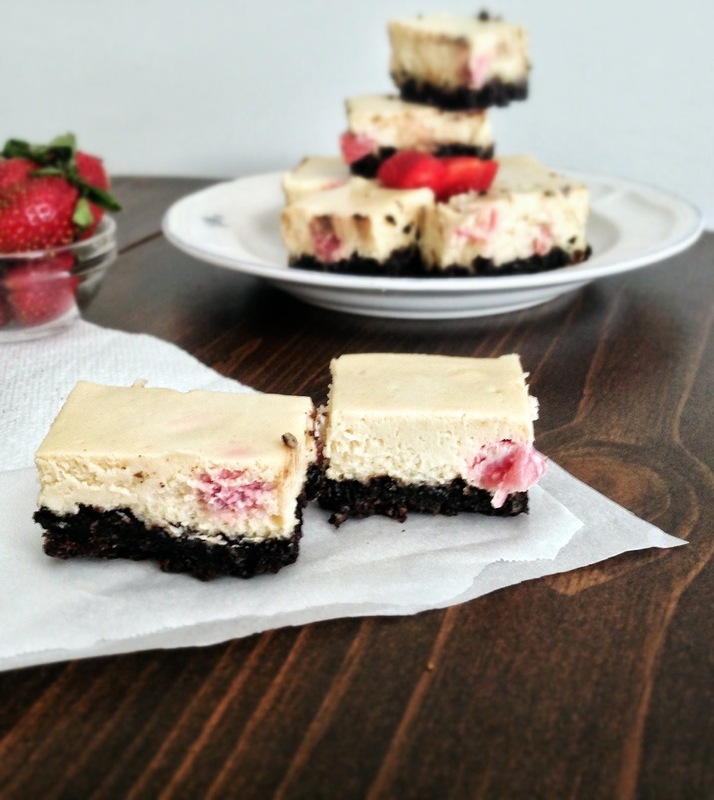 Creamy cheesecake made with tart pomegranate Greek yogurt and speckled with sweet strawberries. No need tap out all the seeds from a pomegranate for this cheesecake. Nope. That is waaaay too much work. I just used pomegranate yogurt that has the seeds mixed in! The other great thing about these bars is that they are EASY. Yes, I know, I usually say this about my all my recipes, but I only say it because it is true! 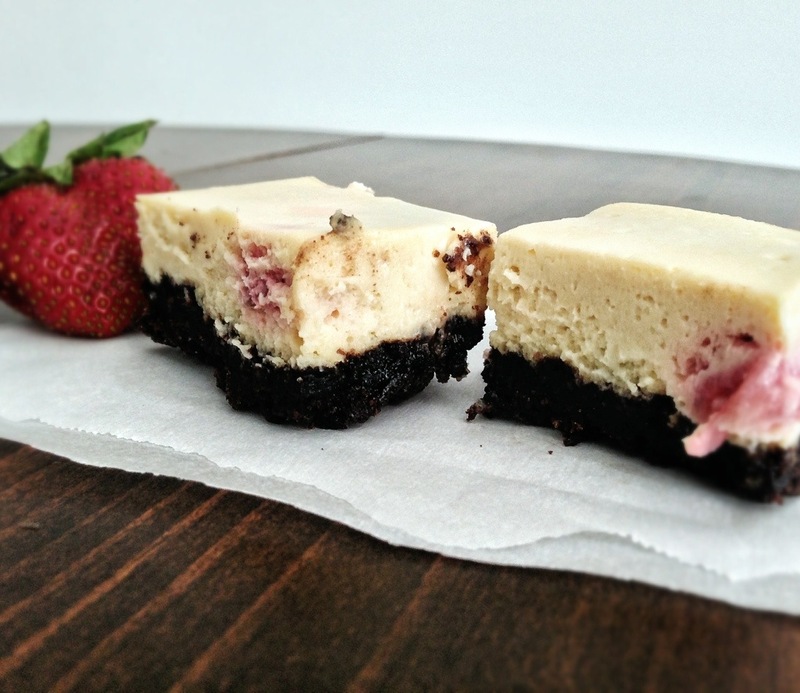 Let’s make some Pomegranate Strawberry Cheesecake bars! Start by adding a teaspoon of sugar to about 10 sliced fresh strawberries. Let these macerate – this allows the strawberries to release some of their delicious juice – you can start this step hours ahead if you like. While they are juicing up, make the crust. To make the crust, crush up the oreos in a food processor until they are fine crumbs (my food processor is very crappy, and thus, my crumbs are not fine) These less than fine crumbs still make a super tasty crust, but the bars can crumble a little easier when cutting. While the crust is baking you can whip up the cheesecake layer. The key to creamy cheesecake is to whip the heck out of your cream cheese (and to make sure your cream cheese is NOT cold). You want all the sugar to get incorporated well into the cream cheese so you have NO LUMPS. 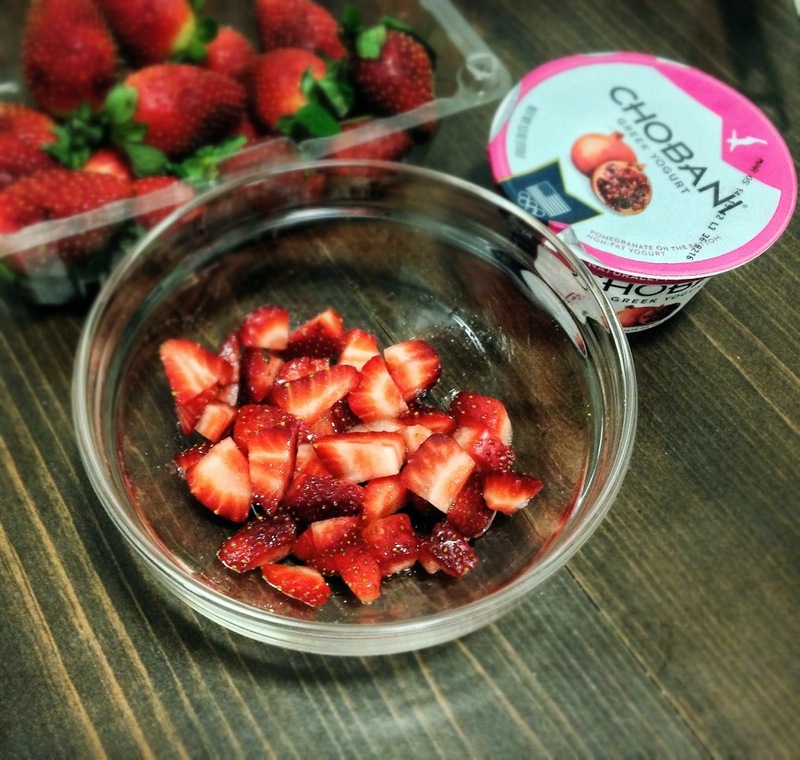 Add the remainder of the ingredients, except the strawberries, and beat until well combined. Then gently stir in the strawberries with their delicious juices! Pour into a prepared pan and bake! Cool in the fridge (a perfect make-ahead dessert!) and get ready to enjoy creamy sweet, tart, oreo-licious cheesecake! Preheat oven to 325 degrees F. Line an 8×8 pan with aluminum foil, leaving an overhang (for easy removal of the bars later). Spray foil with non-stick spray. 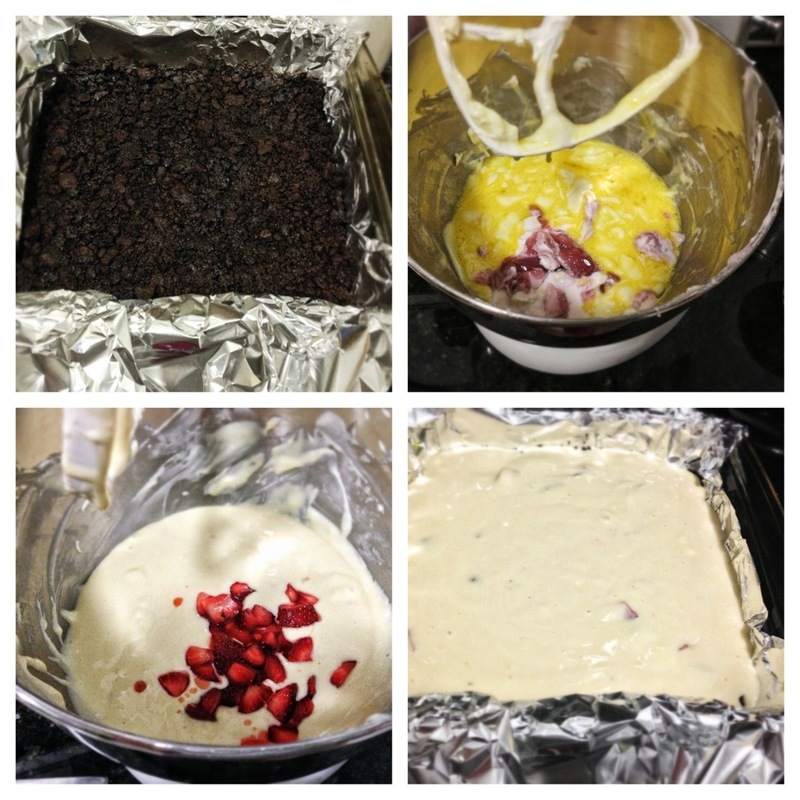 Make the Oreo crust: Using a food processor, crush Oreos into very fine crumbs. Dump crumbs into a medium sized bowl and stir in melted butter until all crumbs are moist. Press crumbs into a single layer in prepared baking dish. Bake for 10 minutes. Remove from oven and set aside. Make the cheesecake layer: In a large mixing bow, add room temperature cream cheese and beat on medium-high speed until cream cheese is whipped – about 2 minutes. Scrape down the bowl and then add half the sugar and beat on medium-high until well incorporated. Scrape down the bowl again before you add the remaining sugar and beat on medium high until sugar is well incorporated. Add in the eggs and beat until well incorporated. Then add the yogurt, flour and vanilla and beat until all are well incorporated. Pour over prepared Oreo crust into an even layer. Bake for 35-45 minutes, until edges are set but the middle jiggles a little. Let cheesecake cool to room temperature then place in refrigerator to cool for at least 2 hours or overnight. After cooling, remove from pan and slice cheesecake. Enjoy! Pile-o-cheesecake. Oreo-licious. Berry-licious. Pomegrant-e-lcious. Yum.